Most of us have heard the news about the massive English language efforts in China prior to the Olympics, how chinese taxi drivers had to go undergo and English course and the chinese government is even sponsoring the every day nation wide TV English lessons. In my mind, this is wonderful and I hope it is working as English is THE language to know (not French how it was perceived a few decades ago), but what I am about to show you are some examples, captured about a year prior to the ignition of the 2008 Olympic flame in the Bird's nest, of how neccessary the English courses are for the chinese population. Following are some signs we have had the pleasure to take pictures of during our wandering around the People's Republic of China. To start you off nice an easy, here is an example of a pretty big and visible advertisement for an international arts school which was hanging in Xi'an on the train station (at least I think this is where it was - It was so long ago:). The next item is one of a kind and the title of the following example is, I quote now "Touris Guide to Mingshan Scenic Area of Ghost City". Note the omission of a letter in the first word already. And under item 6 in the guide we find the following :). Now we are getting to a bit more heavy stuff with a big poster advertising a tour to a wide audience (which is probably not English speaking to their benefit). See for yourselves. The next sign, we saw in ChongQing, is even more prominent, but in this case, I might incline to a weathered condition where the connecting line might have just disappeared, but one never knows. And finally, the most beautiful pearl at the end. Let's see if you can spot the real crab. Perhaps the Russian confused them :). We actually orded it and it was very very good. Some of you might wonder, how much a trip around the world can cost and how to even go about planning such a feat. Well, do not wonder anymore, you will find out more in a second. Our budget for the trip was set to about 1000 euro per person for one month. Now remember, this was just the actual cost of a month while on the trip already. Before you embark on your journy, there are other expenses that one needs to take into account. Such expenses could be the flight tickets (if you are buying around the world ticket), visas, travel insurance, miscellaneous vaccinations (ouch:)) and necessary equipment if not owning it already. The flight tickets can be usually bought directly from one of the airline alliances such as Qantas in One World etc.. Don't forget to set up a frequent flier program to collect them miles :). We got ours from a travel agent Kilroy which was quite nice. For some visa information see our Visas section where you might find some information, but the price is minimal here, it is more just paperwork and waiting. Insurance usually comes to about 1000 euro/year, but the options here also depend on what country you are from. One of our insurances was from Allianz which has a good offer in a lot of countries. Start your vaccinations at least 4-6 months in advance, so you have enough time to get them all, for more info check out the Tropical Medicine Center. And here is a little grid which will give you a better understanding of the costs in each country and continent. Our goals was 33 euro per day per person, so you can make your own conclusion how we did here :). If you have ever visited the United States for a bit longer than just a couple of days, there is no way you could not come across the typical Anchor Bar spicy buffalo wings which are served almost in every restaurant (obviously some better some worse). Some restaurants even specialize only in this delicious treat from our feathered friends. It does not get much better than a big plate of the spiciest wings, fries and a good beer to flush it down with. The real wings are suppose to be marinated in a wonderful spicy sauce which gets your pores dripping with sweat and turns your nose into a leaking dam. In the true sense of the chicken wing fashion, we decided to explore Prague's restaurant scene and see if the Czechs have mastered the art of the chicken wing. After a short search on the internet we found a few restaurants around the center (Wenceslas Square) which advertised spicy chicken wings on their menu. Equipped with empty stomachs, carefully selected chicken wing criteria (1.spice-level 2.meat 3.dips 4.price 5.service and other factors), the optimism that we will succeed in our mission and a few crowns, we embarked on the Chicken wing tour de Prague. The first restaurant we visited was called Amigos and was portrayed as a real Mexican joint. From the menu, one could tell that they were serious about the Mexican dishes, so I'd definitely go back to try some of the food from our latin brothers. However, since our focus were the spicy wings, we went right to the business and ordered a big plate to share with couple of Gambrinus beers along with a plate of fries. The waiting staff did not seem to be the most enthusiastic bunch, nevertheless, they did manage to get our order in and out quite fast (10 mins tops). The order was 12 wings for 99 Czech crowns which is about 8.25 crowns per chicken wing. Very reasonably priced for center of Prague. Well, if the price was good, the wings were lacking a bit. It is true that the wings themselves were very tasty and crispy, but they were not marinated in a sauce. Instead, it came with a separate spicy dip which was nothing more than a Tabasco sauce poured right out of the bottle, so obviously that does not constitute a good chicken wing experience. Furthermore, the fries were taken out a bit too early out of the pot, so weren't the crispiest. The wings did come with a blue cheese dressing which was actually made out of the real deal cheese, but was quite thin. The only thing that was quite well served were the carrots :). Our second victim was an American western style restaurant called Buffalo Bills. This place really has some attitude and the decor is just great with the American country music playing in the background. Sets the mood just right for some wings. Since we were here for the wings, all the other distractions were secondary though. 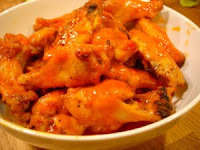 Buffalo Bills advertised 8 spicy wings for 136 Crowns called Annie Oakley's. This puts the price per wing at about 17 Czech crowns, about double from Amigos, so quite pricey. Nevertheless, we got some Corona and waited for our order. We did have to ask for extra blue cheese on a side as the wings were advertised with ranch dressing only. Long story short, the wings came out very quickly, so that was good, however, the spiciness would be at zero as they looked more like a BBQ or Jack Daniels sauce wings. After asking the waitress if these are really the spicy wings we ordered, the answer was a disappointing yes. The only thing that was right with these suckers was that they actually were marinated in a sauce and not served with the sauce on the side. The fries were very very good, but that was offset by the carrots which were quite tasteless and old. The waiters were nice and spoke English, so that was a plus. After running into a couple of already closed restaurants which were advertising spicy wings, we found another Mexican place, called Czech-Mex. Our hopes were very low at this point. The wings we tried so far were so close, but yet so far from the original spicy buffalo wings. Czech-Mex had 16 spicy wings for 115 crowns which puts the price per wing at 8.25 Czech crowns, so the price was right. The wait time was not too bad either about 10-15 minutes and the waitresses pleasant. You can probably guess now though what the result is going to be :). Not wanting to break out of the pattern, we received good looking wings which were dry and the sauce was of course where else than on the side. Furthermore, the so called spicy sauce was nothing more than a few spoons taken straight out of a Sweet Chili sauce bottle. So spiciness very low. The fries was too thick and they did not even have the blue cheese dressing, so we decided to try tartar sauce on a side which was ok. So, in conclusion of our first chicken wing escapade in Prague, Amigos was probably the closest as far as the true chicken wings go, however, still very very very far from the original stuff. Quite a disappointment so far, but we promise we will keep looking until the ultimate spicy buffalo chicken wing joint is found or established. If you know of some places that might qualify, even outside of Prague around Europe, PLEASE do let us know in the comments as we are wings crazy and want to satisfy the craving :). The great thing about central Europe is that you can just hop in a car and get to completely different surroundings in a couple of hours. After intensive days with online job hunting in Vyskov, we decided to break the routine and go to Vienna for a day. Jawohl! Two hours driving and we were there. Parked the car and got out into a gorgeous sunny weather. We decided to start our action-packed day with the number one in most "top Viennese sights" -lists, the Schönbrunn palace. After entering the gates, we spent the next two hours in awe, trying to find synonyms to "amazing". The palace and its gardens were indeed very impressive. After buying the ticket we got a free digital audioguide and were able to wander in the rooms at our own pace. There was plenty of information and really interesting details in the decor, so after our visit we were not wondering anymore why people were able to buy full-day tickets to the palace. Highly recommended. Since we only had a day in Vienna, we then decided to move downtown to see some other sights. It soon became clear that Vienna is the home for an impressive amount of historical, massive and breathtakingly beautiful buildings. Get yourself a comfortable pair of shoes and tour the center - your esthetic eye will surely be impressed. We admired the glass windows of Votiv church, visited the St Stephen´s cathedral, saw the magnificent parliament building, Rathaus and Hofburg castle, stopping occasionally in the many parks to get a break from the heat. Some ad hoc details: Plenty of biking and bike roads in this town. Also, I found it quite affordable compared to, say, Ireland or Nordic countries. One day in Vienna was a scratch in the surface and left us hungry for more. On the next visit, we could visit the Belvedere palace and many others that we just walked by this time. Also, we did not eat Sacher-cake - unforgivable. We hope to come back here one day soon.